Operating from just south of Winchester I can generally cover most of Hampshire but generally exclude the extremities of Aldershot/Farnborough and south-west of Lymington. While designing here presents few problems I lack knowledge of landscape contractors who work in these areas of the county, making progression of any design more challenging. 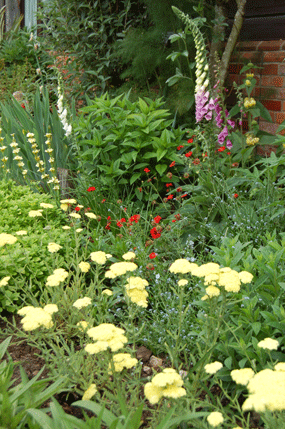 It is unrealistic to predict how much it might cost to design your garden until I have seen it. Then, after discussions of both your requirements and associated budgetary implications, I am usually able to give you a maximum figure for my fees to an agreed stage of the design process. I do not charge VAT, and for initial visits within Hampshire I do not charge a fee. Construction costs can vary considerably. In general the 'hard' landscaping elements such as paving or structures will consume the greater proportion of any construction budget. In comparison, 'soft' landscaping (such as planting and lawns) is relatively cheap. It is by the manipulation of hard and soft elements that I am able, within certain limits, to tailor your design to fall within your particular budgetary constraints. 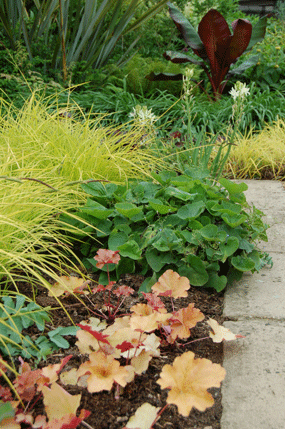 As a very generalised guide to construction costs, one is unlikely to achieve worthwhile changes to your hard landscaping with a budget of £5000 (a figure of £10,000 being more realistic for a small garden), although more could be achieved in terms of planting with this amount. In contrast, for a typical modern small garden with no particular design difficulties or exceptional requirements, a budget of a £25,000 might impose few constraints on the design. Every garden is different however and it is unwise to fixate on the particular figures given as examples. Your individual circumstances and their effects on design and construction costs will be discussed during our initial meeting. 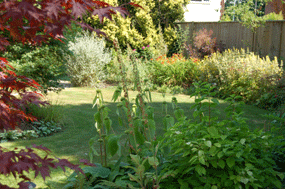 I consider that the best time to design your garden is when you are ready and keen to do so. However one must bear in mind that to do a proper job takes time in relation to the design work, contractors' work loads (i.e. the amount of work any contractor is committed to before they can start your job) and the time it takes to actually build your garden. Therefore if you want to have your garden ready for a particular summer, it is unwise to start thinking about it during the spring of the same year. In this case it would make more sense to start the design process during the previous autumn. 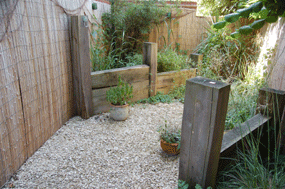 Once your garden has been constructed and planted it might take a few years to realise its full potential. In general, shrubs and trees grow more slowly than herbaceous perennials and so it can take a while for a balance between these different types of plants to be achieved. While one can choose to plant shrubs at larger sizes to obtain a more instant effect, these will require extra aftercare and cost considerably more. Ultimately the choice is up to you. Can you just design part of my garden? For an average sized garden I would discourage attempts to design just one part. The reason for this is that in order to achieve the best results it is necessary to integrate all parts of a garden, with any one element relating to the next and so forth. Do you present different design options? As a general rule I present just one layout design to my clients. I have found in the past that when I have offered more than one option my clients invariably choose the one that I like best anyway! If necessary however, any design can be modified once within the agreed maximum fee structure (as long as any changes remain under the agreed design brief). Further revisions, or any which fall outside the initial brief can be carried out at cost (charged at the hourly rate). Who is going to build my garden? I do not build gardens, but once you have approved your garden design there are various options available to you for getting your garden built with which, if you wish, I am able to help. If you have the time and commitment (and a very strong back), you might be able to build your garden yourself and thereby reduce the necessary budget (or conversely, achieve more for the same amount of money). 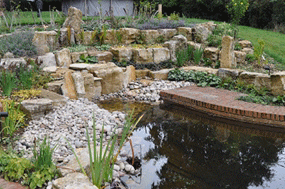 Most of my clients however engage the services of a professional landscape contractor. 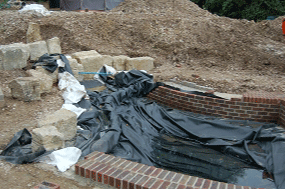 I am able to introduce suitable contractors and obtain quotations from them for the work in your garden, based on the specifications I provide. You may then choose which quote to accept, or can obtain quotations from alternative contractors if you wish. I am not affiliated with any of the contractors that I introduce. While I usually only suggest known reputable companies, their introduction does not imply a guarantee of their work. Whichever option you choose, I can guide you through the process as necessary. 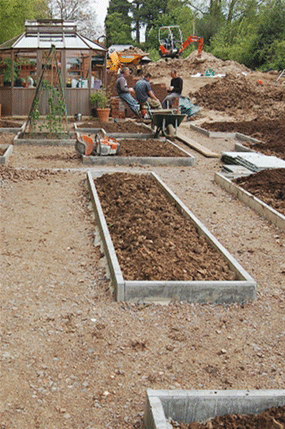 Must the whole garden be built at once, or can I spread the construction costs? 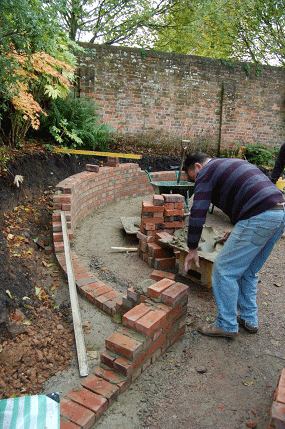 Once the design process is completed it is often possible to pick bits out to construct over time, safe in the knowledge that the whole garden will come together in the end. This is not necessarily the cheapest method however, particularly if the individual packages of work are relatively small. One must also accept the risk of running out of steam and never completing the project! 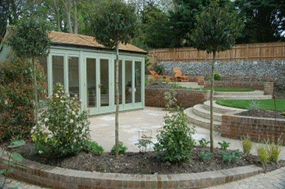 Such staging options for your garden can be discussed during the design process. If you would like to discuss how I might help you with your garden, then please telephone or e-mail me to arrange a meeting.